Earlier in December I painted my nails red & green with some glitter for the season. When that started chipping off, I decided to change it up for the actual Christmas time. 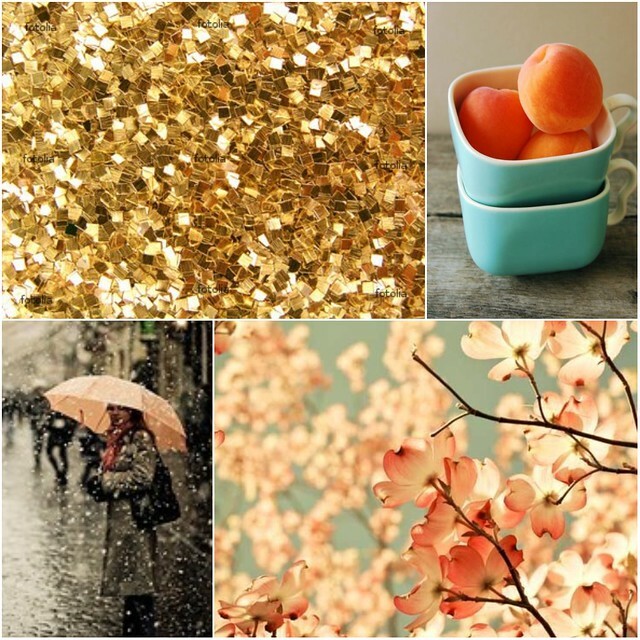 I've fallen in love with peach hues & gold glitter. I am pretty sure that my next few manicures will involve glitter & in fact I am only posting this so I can go take this current nail color off! (I got some more for Christmas & am dying to use them! I am sure that my nail polish collection is nearly half glitter polishes! I want to thrift a spice rack to hang in the bathroom (or somewhere) to hold them all! I've seen that idea floating around on Pinterest! I just started a Color board on Pinterest with these as my first pins! 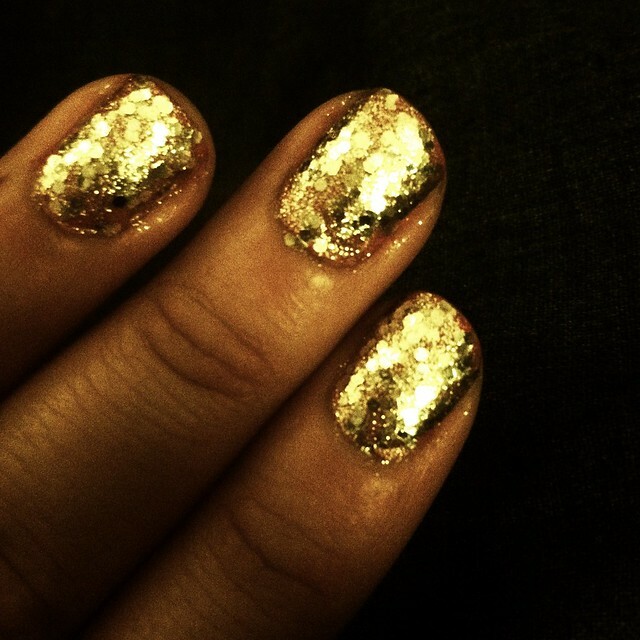 I also threw on a top coat since the glitter makes your nails all kinds of weird, texture wise. But, like I am sure you know, top coats are important! Maybe one day I'll do a post about a proper manicure since I am supposed to be completing this class! 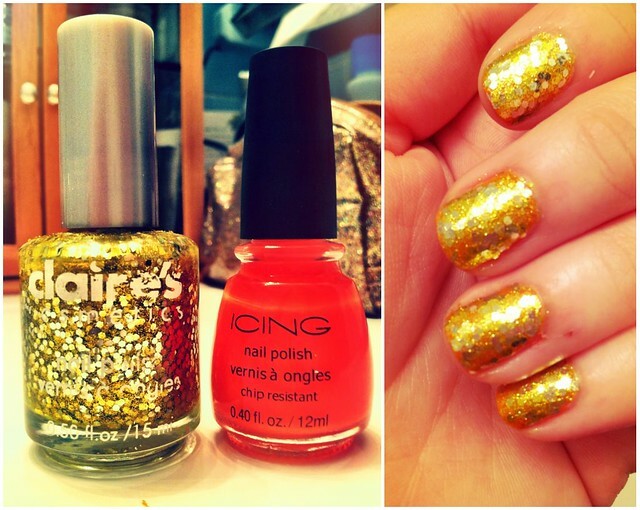 I've already mentioned that I love Icing's Chip Resistant Nail Polish. It stays on forever! I recently bought acetone polish remover to get it off easier. Acetone polish remover is a bit more harsh but boy does it take off glitter polish & chip resistant stuff! I used to paint my nails a lot when I was younger. I had the time to actually take care of them. But now I search out polishes & top coats that promise longer wear. I don't have the time to keep painting & painting. When they begin to chip I begin to not care. I'll leave chipping nail polish on forever and it just looks so horrible. By the time this starts to chip, I am ready to change it up. I hope you had a great Christmas! I look forward to looking at all the Christmas posts in blog land in the coming week as we all prepare to ring in the new year!